We now know how Microsoft is spending $10 million of its $300 million campaign to combat Apple’s “Mac vs. PC” ads: by hiring Jerry Seinfeld. The Wall Street Journal reported today that Seinfeld will be “one of the key celebrity pitchmen” in the campaign, and he will appear in ads with the master of Microsoft’s domain, Bill Gates. 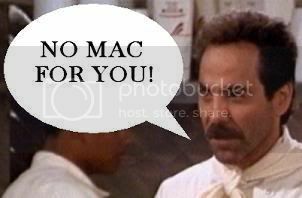 By now you probably know the basics of the saga: Apple bombards the airwaves with commercials about how Macs are cool and PCs are lame, now everyone thinks Vista stinks, yada, yada, yada, Microsoft’s finally fighting back. But so far, the Seinfeld news is going over about as well as George Costanza’s conversion to Latvian Orthodox. If there’s one surefire way to convince everyone Vista is cool, cutting edge and not liable to get frazzled by life’s minor complications, it’s hiring a 1990s sitcom star and professional kvetcher! The site also points out that Seinfeld’s sitcom character actually owned a Mac, which was semi-prominently displayed in his apartment. I love a funny commercial, no matter what it’s for, and if MS can entertain me, thats a good thing. But remember… MS already holds over 90% of the market!!! WTF are they trying to do? All it’s doing is reminding us of Macs, and just how good they are! Why else are they advertising like that? Microsoft is planning to put Bill “The World’s Most Charismatic Man” Gates in their adverts? I have a lot of respect for the man himself, and particularly what he is doing these days, but he’s a sure cure for insomnia. Has anyone else watched his keynote addresses? Watching paint dry is more interesting. Personally, I think Gates has had some hilarious moments on camera, like this “Napoleon Dynamite” video. And I’m a huge Seinfeld fan, even though he hasn’t been relevant in almost a decade. So I’m interested to see how Microsoft pulls this off. Sure, there’s a chance the ads fall flat and make Microsoft look sillier than Jerry in a puffy shirt. But Microsoft has taken a PR pounding from Apple and must at least try to fight back. And who knows? Maybe the ads will be a huge success, PCs will be considered cool and Macs will be lame. Now that would truly be a bizarro world.